Based in Marysville, Kansas, photographer Omar Hawkins captured scenes of his town and the surrounding communities from 1912-1945. The images reveal the details of small town America and the emergence of the automobile and other modern conveniences. The Hawkins photograph collection at the Kansas Historical Society includes thousands of his photographs. While the entire collection is being digitized, over 2,000 images are currently available for viewing. This collection is very rich in content from Marysville, other towns in Marshall County, and surrounding counties. 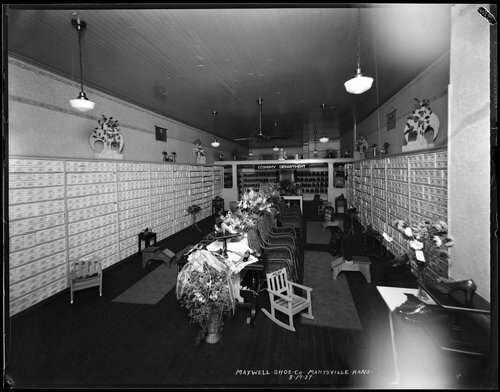 A series of photographs documents the Montgomery Ward store(exterior and numerous interiors of products being sold) in Marysville in the late 1920s. The text version provides the description of each image (and is thus available to our search engine) but we are unable to link from the individual photo description to the image at this time. We hope to make that possible in the future. Based in Marysville, Kansas, photographer Omar Hawkins captured scenes of his town and the surrounding communities from 1912-1945. The images reveal the details of small town America and the emergence of the automobile and other modern conveniences. The Hawkins photograph collection at the Kansas Historical Society includes thousands of his photographs. While the entire collection is being digitized, over 2,000 images are currently available for viewing. This collection is very rich in content from Marysville, other towns in Marshall County, and surrounding counties. A series of photographs documents the Montgomery Ward store(exterior and numerous interiors of products being sold) in Marysville in the late 1920s. The text version provides the description of each image (and is thus available to our search engine) but we are unable to link from the individual photo description to the image at this time. We hope to make that possible in the future.